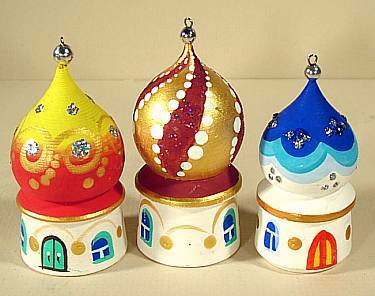 These Christmas ornaments, which depict in miniature the Russian church and their cupolas, are perfect to dress up your tree or to create a unique Russian atmosphere anywhere in your house. All are made of wood and hand painted, with touches of glitter. We can't guarantee the exact design for the 3 ornaments that we send you, but we promise you will get a variety of colors with some slight variation in shapes. Sent in a nice gift box with tissue paper. You'll love them!